Posted by wmmbb in Australian Politics, Social Environment, US Politics. John Quiggin raises an interesting, and to me intriguing question in relation to why do the Americans persist with voting on Tuesday now the original political reasons have ceased to be relevant. Internet sources then to agree that Tuesday voting was introduced by a 1845 presidential proclamation, as distinct congressional decision as for example was the voting in November. The population of the United States was less than the 23 million of 1850 which was the after the admission of Texas, the Oregon territory, and land and people acquired as a consequence of the war with Mexico. The number of voters was less with the exclusion of women and slaves. Posted by wmmbb in South Asia, South East Asia. Kenji Nagai who later died, keeps on filming in Rangoon (via Reuters). In my opinion, the government is Burma (otherwise Myanmar, the more formal scripted version preferred by the current government) must be on the verge of falling. If there are more mass protests they are done, which means that state violence is likely to increase. 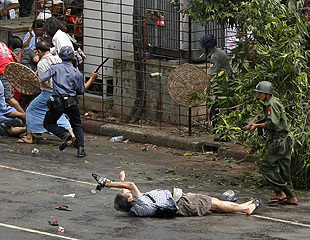 There would be on guarantee that the army will remain united against the Buddhist monks and the population. Posted by wmmbb in Australian Politics, Natural Environment, Social Environment. I was travelling by train today up and back from the big smog, and so I also was reading The Sydney Morning Herald, which means I was working on the puzzles. Now, because I have a duty to my readers and my work ethic (otherwise my obsession), I also took the opportunity to check out what I might be able to post here. Posted by wmmbb in Middle East, US Politics. Yes, the American media can be critical of the President, especially when he makes foolish and obviously untrue statements. They must have been given permission by the owners. Oh! he is the President of Iran without any executive authority and a ceremonial role. I was thinking his role might be similar to the Governor-General, but on reflection I might have to stick to the previous suggestion that Ahmedinejad power is similar to that of the office of Vice President before the ascent of R B Cheney. Well, its a hell of a town, or so it was in the musical, On the Town1..And it is the headquarters for the United Nations. Now Mahmoud Ahmadinejad has come visiting New York with the intent to visit Ground Zero and speak at Columbia, and if you follow the drift, the strident judgments of his detractors, and the frame applied by ABC Online in its written report, if not the more balanced audio from The World Today, that might seem appropriate. Naomi Wolf suggests, perhaps as others have, that there are ten steps that lead from democracy to dictatorship. We might be witnessing the corollary of the opposite development in Burma. Occupation, especially with the planned reificiation in the form the occupiers intended permanent bases as the occupier’s footprint as in Iraq, is the antithesis of liberation. As far as Iraq was concerned, there was the foolish suggestion that the continued occupation of Iraq could be compared to the permanent American presence in South Korea, a comparison that gained piquancy following the disconnect between G W Bush and the South Korean President at the most recent APEC Meeting in Sydney. We can observe some of the consequences of the American military posture in Iraq, including what Robert Fisk described as “the end of history”. The point is taken up by John Curtis, Keeper of the Middle East, British Museum. Posted by wmmbb in Australian Politics, Philosophy. I find it a great pity that we are no longer talking about values in our election campaign. They might after all have something to do with philosophy, policies and politics. Perhaps it was one of those wedge campaigns that did not get taken up. Today, I thought I had at last got a line on what philosophy is. A large claim, I know, but it seems to me that we are a bit like embedded journalists, and our minds connect the dots in certain ways, and philosophy is the art of self reflection, a self that has been constructed in our social and educational experience and so forth. Hold on to that thought for a moment, partially expressed as it may be. General Wesley Clark has an article in The Washington Post in which he reviews the situation faced by the US Military in the light of Vietnam, Iraq, Afghanistan and other conflicts. His observation are generic in that they apply to any country, although the sense of the United States as the exceptional nation is still held to be, now less tenuously perhaps in the face of the relative state of the buying power of the US dollar tied with the foreign debt, and a general sense of US decline. Fundamental military questions include what type of technology do you invest in given that even with the Pentagon cash book there are opportunity costs, and what type of training would be most beneficial. What are the lost opportunities involved in military spending and the suffering and deaths of military conflict, both military and civilian? In Japan the Liberal Democratic Party has been in government since the Second World War. The reverse side of the that permanence has been the impermanence of the prime ministers, who have usually enjoyed short stays in office. How different from Australia, where prime ministers have to be shoehorned out of office once they get established. J W Howard sounded to my ears remarkably like R J Hawke in claiming he was the best person for the job, except that Howard it seems was accepted for lack of an alternative given the time constraints before the election, and Hawke was ditched. D Petraeus is the military hero, he has a chest full of nineteen rows of military decorations, who appeared before the US Congress to claim that the escalation ordered by G W Bush is working, and as a result the number of troops in Iraq will be reduced by 30,000 to restore the situation ante. Petraeus reports to W Fallon, who seems to take a less heroic view of the general, and has significantly different strategic understanding of the situation in the Middle East and South Asia. J W Howard is reported as saying that if re-elected he will retire during his next term. Here is a person who acted tenaciously to hold the position of prime minister during the last week in the face of consistent polling that suggest he has no chance of winning the next election, and may well lose his own seat. Is this a recognition, at last, he recognizes the next election is lost after eleven years of the Howard dark age – we can only hope. Three months after a national election, Belgium still can only muster a caretaker government. To my knowledge this development has not been widely commented upon. The country is divided into the Flemish north and the Francophone south, with a small German speaking on the eastern border, and then bilingual Brussels, one of the headquarters of the EU is located just inside the Flemish area. For the past decades Belgium has been undergoing a linguistic fragmentation reflected not just in areas of government authority but including linguistically distinguished political parties representing different regions, which is compounded by having a loose federation of seven governments for 10 million people. The Premier of Queensland shows a person can resign from a political office with at least the prospects of good results personally and for the government that he led. With change might come renewal. J W Howard would not have the vision to take this step, and so he may well be stuck in his own tragedy. Now in the case of Howard there is nobody to take his place, or wants to take his place. Hubris, or whatever it might be, is a tragic mistake for a leader. J W Howard will I suspect not resign, or even be forced to resign by his party. The time to resign has long since passed. Now we have something of a tragedy to play out if the polls and the political market research proves correct.